Both unintentional injuries and those caused by acts of violence are among the top 15 killers of Americans of all ages. Injuries are the leading cause of death for Americans ages 1 to 44. Over the past decade, the death rate from all injuries increased by 8 percent. 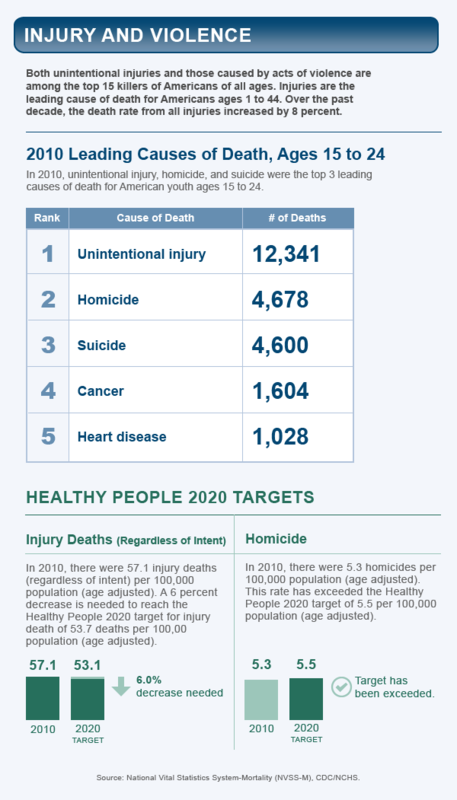 In 2010, unintentional injury, homicide, and suicide were the top 3 leading causes of death for American youth ages 15 to 24. In 2010, there were 57.1 injury deaths (regardless of intent) per 100,000 population (age adjusted). A 6 percent decrease is needed to reach the Healthy People 2020 target for injury death of 53.7 deaths per 100,00 population (age adjusted). In 2010, there were 5.3 homicides per 100,000 population (age adjusted). This rate has exceeded the Healthy People 2020 target of 5.5 per 100,000 population (age adjusted).